Outstanding! A gripping film that serves as a testament to rising above all odds to lead and protect. An inspirational biographical drama during one of the western world’s darkest hours. Gary Oldman’s performance as the famous United Kingdom Prime Minister is absolutely remarkable. For history enthusiasts, you will swear that you are watching THE Winston Churchill battle his own homefront of politicians and protecting against the Nazi advancement prior to the United States stepping in following Pearl Harbor. The impact of this film is greatly enhanced by the release of Nolan’s Dunkirk earlier in 2017 as this film depicts what was going on in Churchill’s office prior to the valiant rescue operation. The climax of the film includes Churchill’s “We Shall Fight” speech that rallied Parlament behind him–at least during WWII. Screenwriter Anthony McCarten chooses to interject as much amusement and humor as possible in order to balance out the otherwise cranky Churchill and the dire, deadly position that the people and government of the United Kingdom were at the time. Although it is not uncommon for historical dramas to take creative liberties in telling a visual, cinematic story, Darkest Hour sticks closely to historic accounts but does add in material that aids in constructing a cinematic film. A thrilling biographical drama that takes place during the crucial days of the Nazi’s march to the sea to conquer western Europe. With France nearly fallen, the United Kingdom is faced with the most deadly enemy it has ever faced in all centuries leading to this very moment. The United Kingdom is searching for a new Prime Minister in the wake of an abrupt end to Churchill’s predecessor. With both the liberal and conservative sides of parliament at each other’s throats, it would take a special leader to unite the government in order to defeat the Nazis. Generally unpopular, but being the only public servant that had the least opposition from both sides, Churchill was a reluctant choice by the King and his colleagues in Parliament. 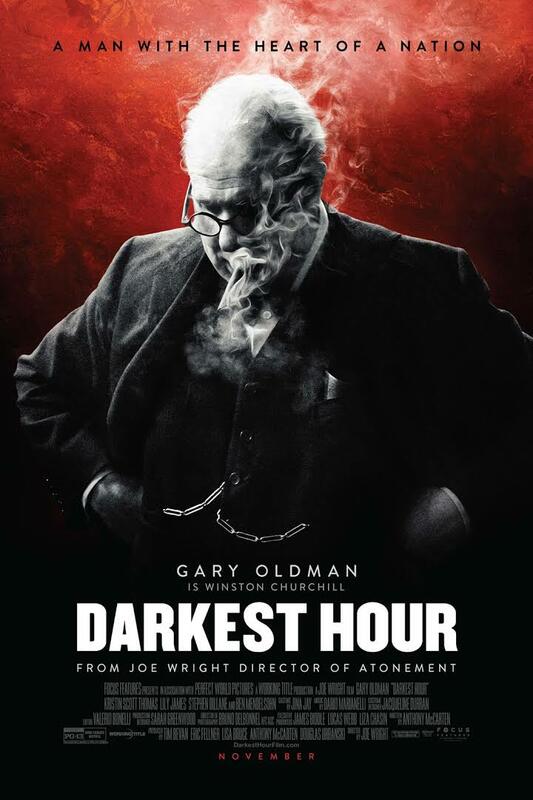 Darkest Hour depicts Churchill’s rise to power and the giants he faced on his first days in office. While he is known to be an unapologetic monolith, a force to be reckoned with, this film also shows his more humble side. All within the span of a few weeks, Churchill is tasked with leading Parliment, unifying the government and people, and protecting the free world. If you haven’t seen Dunkirk, you should watch it prior to Darkest Hour or at the very least follow up with it because it helps to paint a portrait of what was facing Churchill on his first day in office. Oldman’s performance is nothing shy of exceptional. Although all the performances are excellent, including Lily James’ supporting role, Oldman’s contribution to the film aids in creating the masterpiece that is Darkest Hour. The altruistic behaviors and vulnerable sides of Churchill are brilliantly woven into the narrative, an important move because in films past, he was always shown to be the brilliant orator and rallier that history remembers him as. Oldman’s commitment to character, in terms of speech, posture, and more is incredible; his personal commitment aside, the overall look and feel of Churchill is supported by amazing makeup work and costuming. The energy that each and every character brings to the screen is unquestionably precise and highly effective. While this is a story that takes place during wartime, the character-driven nature of the film is more closely aligned with a heavy courtroom drama than a typical war film. No mistaking it, it is still a war movie, just not in the traditional sense. While the actors can bring unique, exceptional energy and screen presence to a film, it is often built upon the foundation of excellent writing. Despite the film exceeding the two-hour mark, no scene ever comes across as filler, unnecessary, or simply extra information. Screenwriter McCarten’s adaptation of the life and times of Winston Churchill is precise, efficient, and powerful. He chooses a no holds barred approach that is unapologetic as Churchill himself. As closely as McCarten aligned his screenplay against what we know from history, he chose to invent one particularly inspirational scene in which the Prime Minister leaves his chauffeur and takes the London Underground (what we call a subway)–a mode of transportation that he remarks never using earlier in the film. It is this scene that paves the way for the bombastic, poignant “We Will Fight” speech that will nearly have you standing up in your seat during his ovation on screen. Such a brilliant move by McCarten to invent a scene that truly feels like it very much could have taken place. It’s a scene that also shows Churchill’s heart for the people he was trying his damndest to protect against the evil across the English Channel. Joe Wright’s Darkest Hour is a must-see film! His direction of this biographical drama is an outstanding work of cinematic excellence. Few directors could have captured the power of these events and the determination of Churchill as Wright has done. The approach of Wright and McCarten may prove to be precisely what is needed for Oscar nominations. Highly recommend for anyone who is fascinated by history or more specifically the events that took place at the time of and leading up to Dunkirk. Darkest Hour also displays a remarkable adhesion to history while adding in elements that provide a much more comprehensive experience that work to inspire audiences.